By Emily Gratopp, MS, ACSM-CPT, Extension Educator, Lancaster Co. This year marks the 50th anniversary of the Expanded Food and Nutrition Education Program (EFNEP). 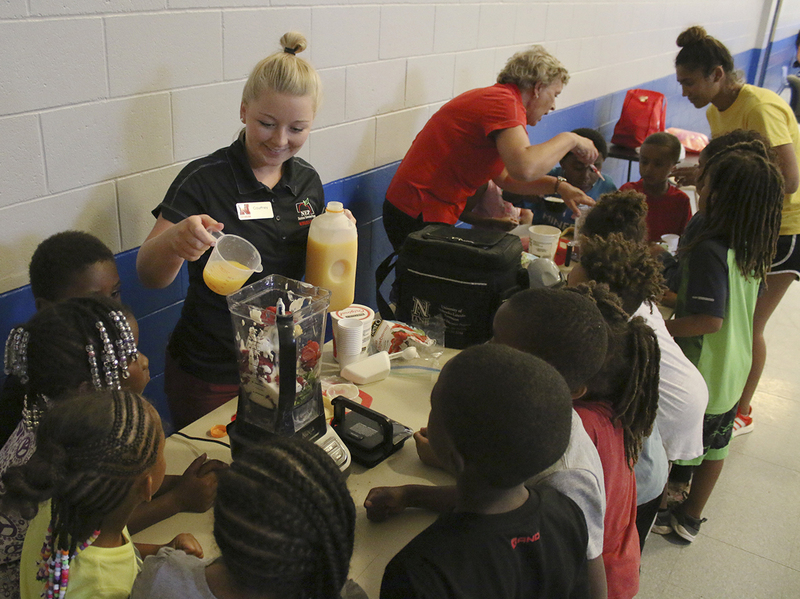 For 50 years, EFNEP has been reaching some of the most vulnerable populations and helping them to use their resources to keep healthy food in their homes and healthy meals on their tables. EFNEP influences the nutrition and physical activity behaviors of limited-resource families — particularly those with young children — through community-based, relationship-driven, hands-on education. EFNEP has evolved and remained relevant to how people live, learn, work, shop and play. The diligence of EFNEP program coordinators and county educators across the nation will drive the continued success of EFNEP into the next 50 years. Arising out of a need witnessed by then President Lyndon B. Johnson to equip families in poverty to combat hunger and increase food security, EFNEP started in 1964 as a pilot program in just a few states. In 1969, after five years of success, Congress allocated funding from the National Institute of Food and Agriculture (NIFA) within the U.S. Department of Agriculture (USDA) to implement the program nationwide. Funding is allocated directly to land-grant universities’ Cooperative Extension systems, so EFNEP is a uniquely Extension program. Currently, EFNEP operates in 76 institutions at land-grant universities in all 50 states, U.S. territories and the District of Columbia. Since 1969, EFNEP has reached more than 33 million low-income families and youth. EFNEP is known for being relationship-driven and community-based. Families participating in EFNEP are taught by peer educators in a series of classes, allowing time for relationships to form. The classes are adapted to fit communities and individuals as needed, including recent use of distance learning and social media. EFNEP’s unique position within USDA and the land-grant universities provides a strong research-base for education and outreach. As such, EFNEP has been the subject and delivery mode for many creative strategies to advance the field of nutrition education. EFNEP has a nationally coordinated evaluation strategy, including the use of evaluation tools for adult and youth audiences. All participants complete an entry form and an exit evaluation during their participation in the EFNEP program. Given the systematic evaluation over 50 years, longitudinal studies show that new behaviors are maintained and that new skills learned through EFNEP can last a lifetime — and across generations. • Diet quality and physical activity — Improved diets and nutritional and physical wellbeing through the adoption of science-based food and physical activity recommendations. • Food resource management — Increased ability to buy, grow or otherwise appropriately obtain, prepare and store food that meets nutritional needs. • Food safety — Improved household food safety and sanitation practices. • Food security — Increased ability to get food directly — and from food assistance programs where necessary—to ensure having enough healthy food to eat. In Nebraska, EFNEP is localized to seven counties which are urban or metro regions: Adams, Douglas, Hall, Lancaster, Platte, Saline and Sarpy. In 2018, 10 Extension Assistants and Associates across the seven counties taught 499 families and over 3,500 K–12th grade youth. EFNEP in Nebraska collaborates with community-service agencies to reach diverse low-income audiences. The Nebraska EFNEP team has skills to teach non-English speaking audiences with three individuals who speak Spanish and one who speaks Arabic. • 92 percent improved their diet quality and 69 percent increased their daily physical activity. • 80 percent improved their food resource management practices. • 73 percent practiced safer food handling. • 43 percent improved their family’s food security. A few of the EFNEP families in Lancaster County include pregnant and parenting teens in Title I high schools and parents learning English within Lincoln Public Schools’ Family Literacy program and Lincoln Culture Centers. The addition of our newest, Arabic-speaking, EFNEP team member brings hope of expanding services to Arabic-speaking community members in 2019. • Almost 60 percent of middle and high school students ate one additional vegetable serving per day and 50 percent increased to at least 60 minutes of physical activity per day. • Almost all elementary students improved their knowledge and ability to choose healthier foods when offered. Key components of EFNEP for youth are teaching recipe literacy and cooking skills. During EFNEP classes, youth practice following recipes and cooking to increase their skills in cooking healthy meals and snacks on their own. Last year, 61 percent of middle school students taught by Lancaster County EFNEP increased their confidence of using measuring spoons and cups, and 52 percent improved in their ability to read and follow a recipe.